Molly Brennan as the Ghost of Christmas Past takes Scrooge to Christmas scenes when he was a sweet boy, and then, as a young man, to his boss’ party where he falls in love. Then they go to the scene where his neglected fiancée decided to end their relationship because she knew Scrooge wouldn’t love her as much as he loves money. Jasmine Bracey, the Ghost of Christmas Present, takes Scrooge to Bob Cratchit’s Christmas family feast where she points out that the youngest son, Tiny Tim (Paris Strickland), is seriously ill. The spirit informs Scrooge that Tiny Tim will die unless things change. The Ghost of Christmas Future (Breon Arzell) shows Scrooge a Christmas day in the future, revealing scenes involving the death of a disliked man and the death of Tiny Tim mourned by Cratchit and his family. It all adds up so that when Scrooge sees a neglected grave with a tombstone bearing his name he pledges to change his ways. Christmas morning, his “Bah Humbug” personality has changed to lighthearted laughter as he begins to treat everyone with generosity and compassion. Portrayed with innovative staging, wonderful costumes and settings taking us back 175 years and an original musical quartet that marches into the past, present and future, the show will appeal to all ages. And it is performed by an excellent, diverse 26-member cast that embodies today’s contemporary spirit. 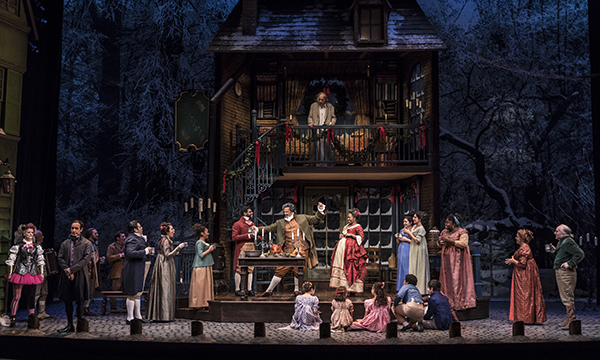 DETAILS: “A Christmas Carol” is at the Goodman Theatre at 170 N. Dearborn, Chicago, through Dec. 30, 2018. Running time: 2 hours, 30 minutes, with one intermission. For tickets and other information, call (312) 443-3800 or visit Goodman Theatre.